On too many days our vision of life is focused inward and we primarily see only what is going through our mind's eye. This is not to say that we cannot function in the real world and make our morning coffee, read the paper, tie our shoes, get out the door to our job and be there almost on time. Then we have those days, when we have our inner dialog volume turned down and we are really looking at the world around us. Suddenly, we see things we never noticed before. Often these objects or people are not directly in our line of sight or considered significantly important to us. 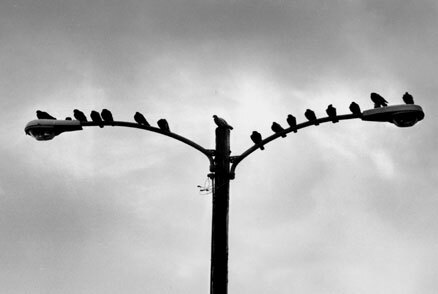 On my daily morning drive down H Street I began noticing that pigeons were sitting on one particular light pole adjacent to the Vocational Center located in the high school complex. They come out and stay an hour or two while appearing to sit in the same spot but also with a very purposeful attitude while clinging to their perch. I queried a school maintenance man and a neighbor but they insisted they had not seen them before or even speculated where they come from. Although we are mostly out of sight, we too hope somebody notices us performing our very important daily tasks.